Are you ready for some football? The Super Bowl is coming up! Usually that isn’t a big deal for us (we’re mostly half-time and fourth quarter fans), but this year we’re invited to a party to watch the big game. Since the Super Bowl has always been pretty low-key at my house, I wasn’t sure what to make to take with me. What would be a good finger-food recipe, easy to fix and that transports well to our friends’ house? 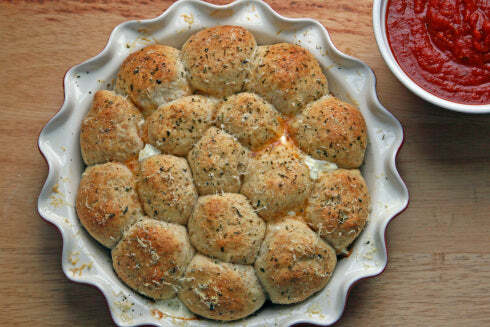 You got it – pizza bites – whole wheat style. Now before you turn your nose up at the idea of whole wheat in your pizza dough, hear what I have to say. My husband worked at a VERY popular pizza place all through college. And not just a fast food pizza place, mind you. This place has history, character, a line wrapped around the block on most weekends and the BEST pizza in town. It has become a sort of Mecca to those of us who ate there during our college years. Needless to say, my husband knows good pizza. Guess what? He likes these pizza bites- whole wheat and everything. My kids do, too. They are tasty, fun to eat and perfect to bring to our friends’ house for the Super Bowl. They also include a healthy cup of Hodgson Mill Whole Wheat Flour, so I feel great about eating and sharing these pizza bites with my family and friends. Score one for the home team! We begin things with my favorite homemade pizza dough– Speedy dough- mixed with Hodgson Mill Whole Wheat Flour. Speedy dough is ready to bake in 30 minutes. By the time your oven is pre-heated and the toppings are collected, it’s ready to roll – literally. This recipe makes enough dough for two large, semi-thin crust pizzas if you decide you want to fix pizza instead. The dough is very easy to put together by hand – put the ingredients in a bowl, mix, knead 10 times on a floured countertop, cover and let it rise for 30 minutes. That’s it. But, I love the way my bread machine will do the work for me, so I put all of my ingredients in the pan, let the machine run on the dough cycle for about 12 minutes and then turn it off and let the dough rise inside for 30 minutes. If the dough is too sticky, add a little extra flour as it you knead it – either by hand or machine. This is what it looks like before I shut the lid and let it rise. 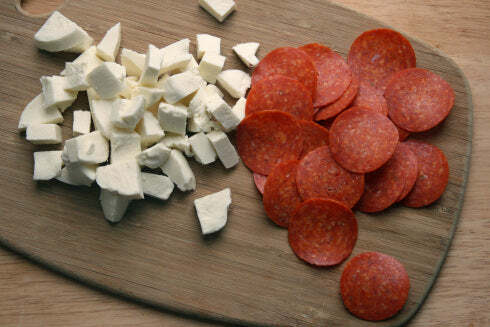 In the meantime, preheat the oven to 400ºF and get together some fresh mozzarella cheese and pepperoni slices. You’ll need about 40 cubes of cheese (which is about 12 ounces). I made half of my pizza bites with pepperoni and the other half just cheese (for my kids). I used one slice of pepperoni (16 all-together) per pizza bite this time, but when I make it again, I will double up the slices or use a thicker cut, so there’s a little more filling inside each bite. The cheese bites used about four cubes of cheese each and the pepperoni bites needed two, so plan accordingly. This is what the dough looks like after 30 minutes. Isn’t it lovely? Hodgson Mill Whole Wheat Flour increases the nutrition in this recipe for sure, but just look at how pretty it makes this dough, too. Dump the dough out onto a floured pastry mat and use your hands to roll it into a log about 25 inches in length. Slice the dough into about 30-35 pieces -about ½ inch per slice. Take one of the dough slices and top it with one or two pieces of pepperoni and a couple of cubes of cheese. Wrap the dough around the filling and pinch it closed. 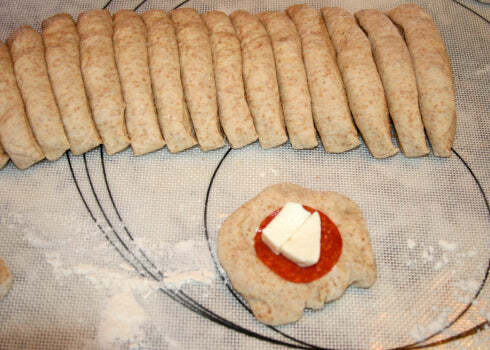 Place the wrapped dough, seam-side down in a baking dish. Repeat the process until you have used all of the dough. After you have all of the dough wrapped and ready to go, brush the tops with a little olive oil and sprinkle them with some Italian seasoning, Parmesan cheese and a dash of coarse-grained salt. The pan in the top left-hand corner of the photo is the pepperoni pizza bites, and the pan in the bottom right corner is the plain cheese pizza bites – also sans “green things” on top to make the kiddos happy. Bake the pizza bites at 400˚F for about 20 minutes or until the tops are golden brown. Look how great these turned out! They will be the perfect pizza treat (with whole grains to boot) for everyone to enjoy at the big game next week. I’m looking forward to fixing them again and I think my family is, too. Serve these delicious whole wheat pizza bites hot from the oven with some warm pizza sauce on the side for dipping. Enjoy! 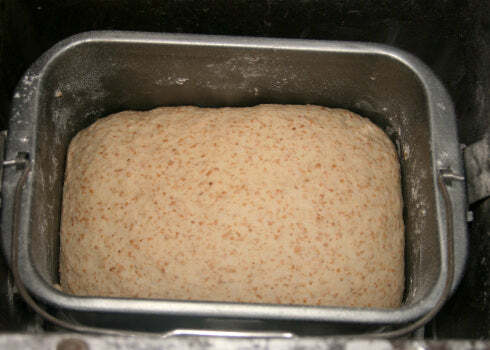 In a large bowl or bread machine, combine the flours, yeast, brown sugar, egg and water. Mix ingredients together and knead until you have achieved a soft but not sticky dough – add additional water if needed. After 12 minutes on the dough cycle in a bread machine, turn the machine off. Cover the dough or shut the lid and allow it to rest for 30 minutes. Preheat the oven to 400˚F. Lightly grease two 9-inch pie plates or baking pans. Divide the dough into 30-35 equal-sized pieces. Take a piece of dough and place one or two pieces of pepperoni on top and two cubes of cheese. Wrap the dough around the pepperoni and cheese and pinch closed. 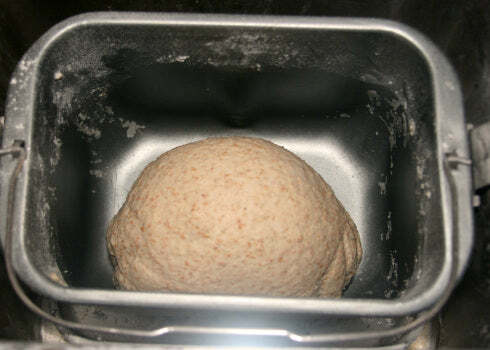 Place the ball seam-side down in a baking dish. Repeat with the remaining dough pieces. 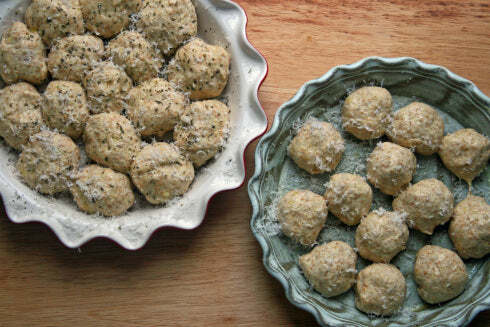 Before baking, brush the top of the dough balls with olive oil and sprinkle them with Italian seasoning, grated Parmesan cheese and a dash of coarse salt. Bake for about 20 minutes, or until the tops are golden brown. Serve them warm with pizza sauce on the side for dipping.